Peter Cushing takes the lead role in an entertaining low budget British horror, directed by Terence Fisher. DDHE UK R0 DVD. 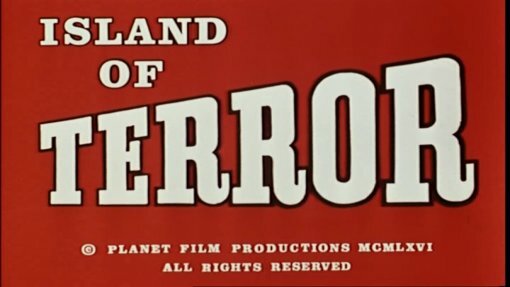 The second of just three productions from Planet Film Studios (the second being similarly island bound Night of the big Heat ), Island of Terror is hardly an original production - the set-up is very remniscent of a television show, with the opening on the island to set the scene, followed by the introduction of the lead characters, brought in to solve the riddle and save the day - it could easily have worked as a Doctor Who episode. Fortunately, the film is written well, avoiding too many of the genre clichés, boasting some nicely written dialogue and with some genuinely tense scenes especially towards the film's rather exciting climax and clever ending. Unfortunately, like many films of its type, the script does suffer from a rather bizarre love plot that is never properly justified, and several jumps in logic suggesting scenes that were never filmed. Top name Hammer director Terence Fisher had spent many years in the mid-1960s away from the famous studio, shooting films in Europe, and some independent British films. When the short lived Planet Film Productions wanted a director to work with Hammer star Peter Cushing, Fisher was the obvious choice. Re-united with cinematographer Reginald Wyer, with whom we worked on some pre-horror Hammer films, including Spaceways (1953), Fisher gives the film his typical solid, yet unspectacular style of direction. The opening of the film, until the creatures are seen, works very effectively and Fisher tries to keep them out of sight for as long as possible with just glimpses and sounds - inevitably though, they do have to take a centre stage, and instantly triple the film's cheese factor. Although brought into the cinema world by Hammer films in the late 1950s, by 1966 Cushing was doing only limited work for the studio and had done a lot of work with new rivals Amicus Productions. His casting is obviously for marquee value, but he does suit the role well and gives a typically strong performance. Island of Terror is hardly original, but is an unassuming and enjoyable little film, with some good acting and solid direction. Recommended to fans of Peter Cushing and low budget British horror/sci-fi. Anyone famous in it? Peter Cushing - the star of many of the best, and worst, British horror films of the 1960s and 1970s. Directed by anyone interesting? Terence Fisher - director of many of Hammer's top films, including The Four Sided Triangle (1953) which takes a similar "danger of science" theme, but with a much more thought provoking storyline. Is it scary? There are a couple of tense scenes that might prove scary. Any violence/gore? A few violent scenes, no blood. Recommended to fans of British horror cinema and Peter Cushing. Good Soundtrack? A nice orchestral soundtrack. The print is decent - with faded colours and some noticable grain and speckling although miles better than a VHS or PD DVD. Audio English original mono sounds fine. Publicity stills gallery, presented as a video file with no music. 24 page booklet. Extensive background details and notes about the film. Availability Available on its own, or in the Peter Cushing Collection boxset. Other regions? Some European releases of this film, no better features. Cuts? The print is 'uncut', although it is missing a brief gory shot that played on some export prints, and is present on the German DVD of the film. English language print. An enjoyable, if unoriginal, film with a good acting turn from Peter Cushing and well directed by Terence Fisher. A decent print and audio with a good set of bonus features. Find our reviews of other films starring Peter Cushing or directed by Terence Fisher. More details about the Peter Cushing Collection boxset. All text in this review written by Timothy Young - 30th September 2006.